Book tickets to visit the Poble Espanyol. 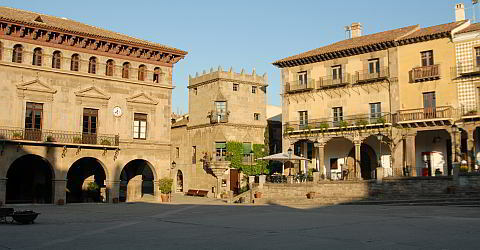 The Poble Espanyol is above all an open air museum with replicas of characteristic houses from all regions of Spain. You can see craft businesses showing their skills in some of the buildings, for example the glassblowers in the Andalusian district. You can buy the products at the stores. Furthermore you can get your money's worth in one of the many restaurants. Even a flamenco stage exists. Book your ticket for the admission of the Poble Espanyol with an audio guide in German and further languages. The Poble Espanyol with its 117 buildings was established for the world exhibition that took place in Barcelona in 1929. It should have been torn down after the exhibition. Only the fact that the village was admired by Barcelona's residents prevented this. There are no cars in the village and it is suitable for families with kids. Simply add the number of people that you would like to book for on the right. Right after booking you will receive a booking confirmation with an immediate confirmation via e-mail and with detailed directions to Poble Espanyol. A free cancellation is possible for 8 weeks after booking, and by no later than December 31 of the respective year. NO cancellation or handling fees, you will receive a full refund of the payed price. A requirement is that the voucher is unused. Simply cancel via e-mail stating the booking code. New: Tickets directly by e-mail! Book here tickets for the Camp Nou Experience. Take a look behind the scenes of Europe's largest football stadium. Perfect for birthdays, Christmas and other events. Our gift voucher is redeemable for all services offered in our shop. Barcelona.de - Simply more experience! © 1997-2018: Barcelona.de Tourist Info S.L.